Coiled garden hose is a spring like coiled pipe which is a miniature version of the usual type. It is a more convenient option when space is at a premium. The tightly one occupies very little storage space and is great for watering your flower beds and garden lawns. The spring like coil can be extended to reach its full length. The hose comes in various sizes. It is also available in different colors. 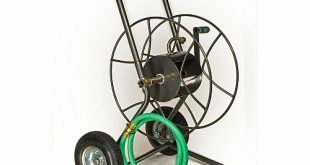 This equipment is the latest innovation in gardening technology and is great as you don’t have to tussle with heavy hoses that usually tend to get tangled. Its’s such a struggle to untangle flat garden hose and then water your plants and lawns dragging the heavy weight behind you. Some days you just want to give up because you are not in the mood to go through the daily struggle with the garden hose. Another aspect that gives gardeners a huge headache is the storage. 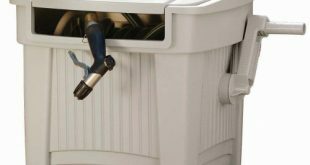 Huge pots, special garden hose storage cabinets, wall mounted and free standing reels are the different methods gardeners use to conceal the unsightly mess of the garden hose. Winding and unwinding the hose is another major hassle. Some opt for automated reels others go for manually operated ones. 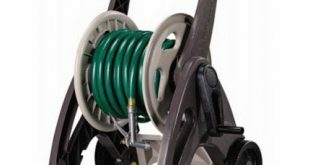 With the arrival of spring garden type, gardeners are finding an wonderful and simple solution to their day-to-day problems of watering their lawns. The coiled garden hose stretches as you move around the garden and coils backs once the work is done. It is easy to store as the amount of space it occupies is very little. 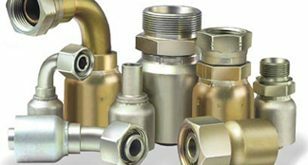 They are usually made of lightweight materials like polyurethane and comes with brass fittings. They are quite strong and durable too. 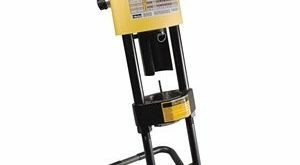 As the coiled spring hose is light weight working with the coil is less tiring than a regular one. Due to superb flexibility a variety of tasks around the house become a lot more easy. 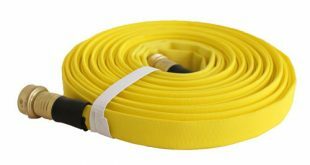 Washing the cars, when camping, while traveling, while boating and generally wherever you feel you will need a hose, this coiled type will make your that much easier. Go for coiled garden hose which is made of industrial strength coil. They are several times stronger and resistant to scratches. Even if you overstretch they are not likely to lose their springing capacity and it won’t any cause damage to the coiling capacity. These industrial strength coils might be more expensive but their better overall performance and durability merits the cost. 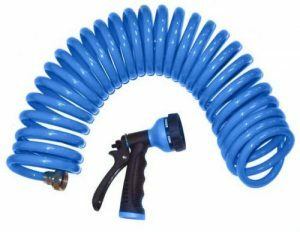 The hose can be attached to a variety of accessories for sprinkling, spraying and hosing. 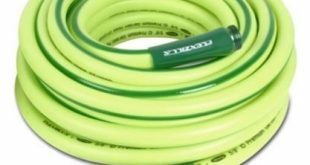 The coiled garden hose is a wonderful addition to any gardener’s basic tools. It’s simple to use and can be stored in any tiny space. It comes in various lengths. For a hose diameter is of around 3/8th of an inch the pressure is about 500 psi. You get different diameter coils like half-inch, 3/8th inch and different lengths of 55 feet, 75 feet and so on. You can buy the required length depending on your need. It comes in attractive colors and with different accessories.